If it's on paper, we print it. 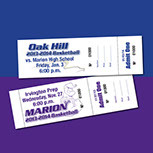 Some examples of the items we design and print are below. If you do not see what you need, contact us, we may still be able to help you! to see more examples of our design and print work. Visit our Contact Us page for a quote or to answer your questions today!